I am going to preface this story by explaining how Henrietta got… as she is. and by that I mean spoiled rotten. When her husband, Marcos was alive and they lived in their own house there was absolutely nothing she was ever denied. Now, that’s not to say that she was demanding and greedy. She would always give you the shirt off her bony little back if she thought there was a need. But, I digress, again… I’m always digressing…. Marcos was always in charge of all the money. Making it, and paying the bills-wise, anyway. In true, old fashioned Mexican macho man fashion, he kept Henrietta completely in the dark about all the bills and the stacking up of the bills and the lack of payment of the bills and anytime H wanted to buy one of the grand-kids something or pay for something for anybody he did exactly as she wished. So you see, it was not her fault that she had a false sense of security about where they were financially. Where they were was in the desert. A couple of years before she had the life changing fall that led to them moving in with us, we began to see signs that the bills were out of control. The non-stop phone calls from creditors when we were over there and the bounced checks on the kitchen table. Henrietta just kept getting mad and telling Marcos to, “Pay the bills!” I really don’t think it ever occurred to her that the money wasn’t there to pay them with, and he never said those words to her, that’s for sure. Well, I could go on about little scenarios that happened like us discovering that Marcos had taken out loans with his pension and their life insurance as collateral, the metric ton of unopened and unpaid bills we found hidden in the trunk of his car, and a multitude of other things, but suffice it to say that things were about as bad as they could get when we jumped in and took over the bills. It was a case for the bankruptcy court for sure. I think it upset Marcos more than Henrietta. But there was absolutely no way there was ever going to be enough money to pay off those credit card bills. Not even close. So for a while there, Henrietta was becoming used to not just buying any little pretty thing she saw in the sales circulars. The hard part for her was not buying for others. Especially since the rest of the family kept showing up at her house with their hands out like they used to and she was forced to say things like, “Oh, I don’t have any money.”. However, that phrase changed to something like, “Oh, take some groceries!” John and I were doing all the grocery shopping for the two of them and, My Gawd. You wouldn’t believe the amount of groceries that went through that house. Once a week we would treck over there and take stock and get her list and buy enough groceries for a solid month and it was wiped out the next week. She really had scaled back a lot. We didn’t even argue with her about it… too much. Now, H rarely asks for anything but, when she does it is almost always so far off in left field I feel momentairly dazed. Here it is, Christmas time, and money is certainly as short as it has ever been. 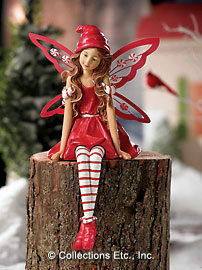 Homeowners insurance is due next month along with property taxes, not to mention the gifts that need to be given and the one and only thing she found in the multitude of catalogs we have, that she has to have is this little “Candy Stripe Fairy” in Collections Etc. … for HER. OK. Yes, it’s cute and “Seven inches tall!”, as she keeps telling me. She wants two, (identical “shelf sitters”), to put on our mantle. Now, I’ve only got the one fireplace. I don’t want two of the things on it, anyway. I explained to her that they are $18.00 a piece and she looked momentarily stunned and said she wanted two of them anyway. So with some quick math, (ha! That is SUCH a lie. Math has never come quick to me… er, digressing again… sorry. ), I deduced that one of the little critters was going to cost $26.00 with the S&H. It seems like so much hoopla over such a little thing, but, she is relentless and I have heard about it every time I have seen her today. Every. Single. Time. I know that the price doesn’t really sound like much, but added all up, it “all adds up!!!”. I am sorry you have to say no, but look at all the better things that need money – LIKE FOOD! A BIG HUG TO YOU AND THE HUBBY!!! It is not easy, but bless your soul for doing everything you are! You are amazing! Predo’s last blog post..Free Hugs…. you should print out two pictures of the thing and put them in some frames from the dollar store and put THOSE on the mantle. I sometimes wish Brad would take over the family treasury but it would be a disaster. I hate doing it. My dad always handled the money and would just give my mom an alottment for groceries and such. Now she has an allowance. You, my love, are to be commended. John, too. I can’t imagine either of my parents or his mother coming to live with us. Mine, simply because of TEH GUILT stuff they lay on. His, because I don’t even know her. Ree’s last blog post..Sharing Saturday – Saving you from my complaints. See this is one of the MANY reasons SSG is not married. She FREAKS out about sharing finances. You guys are doing an awesome thing and I know deep, deep down, in her little fairy desiring heart she knows who the real fairies are. I’m in a similar position with my In-laws… not so much over finances but other things where we are constantly involved with them and their craziness. My husband’s way to deal with it is to pretty much ignore them so I’m left with dealing with the craziness. I don’t have a good answer for you…my secret code to my husband when I’m really feeling like I’m going to explode at them is to say (and think about) pretty flowers. So wishing you lots of “pretty flowers” to get through the season! Deep breaths girl. You guys are doing an amazing and wonderful thing. And I don’t think it’s wrong that hubby takes care of these matters, it IS his Mother afterall. It just stinks that it has to be done… by anyone. You and your family are in my heart.